This is the final post of a four-part series by Rebecca Rohan, “The Secret Guide for Super Moms” — tips, tricks and hacks for busy moms who need to know everything that’s happening in their house. If you believe Pinterest, every home repair or improvement project can be a do-it-yourself job. Apparently, if every blog is to be believed, moms and dads around the country are remodeling bathrooms, rebuilding old houses and refurbishing vintage furniture — and they do it all the time! And they look great doing it! And they have plenty of time to take lots of photos! Maybe some people really are able to do it all (and write about it, too). Most of us are too busy and simply don’t have the training to do more than the basics around the house. When it comes to potentially dangerous repairs, a super mom knows that she needs a professional. When the time comes to fix, rewire or repair her home’s electrical needs, she knows she needs an electrician. Why do you need an electrician if you have a small problem? Electrical wiring is complicated and can be dangerous — and it’s tough to spot signs you need an electrician. An amateur electrical job may cause poor wire connections, overloaded circuits or faulty grounding. These situations are hazardous to you, your family and your property. While it may be tempting to try saving money by doing it yourself, or trusting your spouse or a friend to help, you’re better off spending the money to have the job done right. Let’s take a fairly common scenario: your fuses keep blowing, or your circuit breakers keep tripping. Yes, you can keep replacing the fuses, but do you know whether they’re the right type? Screwing in a 20- or 30-amp fuse as a replacement for a 15 is tempting—no electricians needed, right?—but now you’ve created a fire hazard by overloading your wiring. The smarter move: call a professional, certified electrician to wire a new circuit. Like fuses, circuit breakers are meant to prevent circuit overload and the risk of fire, but we use much more electricity than people of our parents’ or grandparents’ generation. As you upgrade and add appliances and gadgets, you may need to upgrade your circuit breaker panels to adequately supply your home with power. Hire an electrician to do the job, not your brother-in-law who swears he did the same kind of work in the navy. The work is extremely complicated and should not be attempted by an amateur. 5 Signs You Need an Electrician. Electrical malfunctions cause more than 50,000 house fires each year, according to Electrical Safety Foundation International. Since the majority can be prevented, it’s important to keep an eye out for warning signs. Extension cord overload. With aesthetics aside, there’s a reason electric wires must be buried within walls. Undisturbed wiring systems will work longer, where disturbed wiring systems show potential for trouble. Hot switch plates or outlets. Even when appliances produce heat, there should never be hot outlets. Electric current my make a plate slightly warm, but if you find that the outlet is hot, turn off whatever is plugged in. And consult an electrician! Sparking. This should be an immediate red flag. 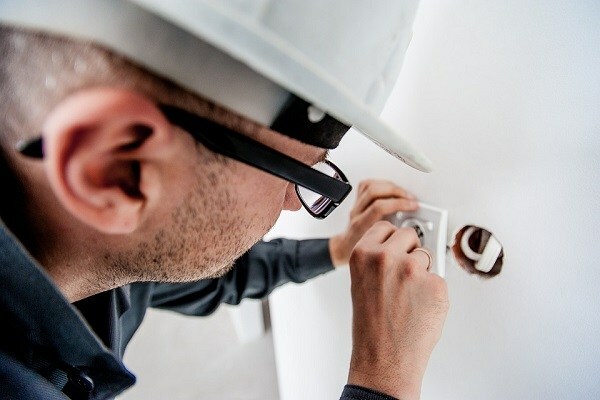 Whether an appliance fixture is damaged or the actual breaker panel is sparking, a call for an electrician will be much cheaper than you trying to fix it yourself. Flickering lights. If you happen to see dimming or flickering lights, they’re more than likely caused by a problem bigger than the fixtures themselves. Consider moving lights to different circuits or installing dedicated lines for major appliances — from a professional, of course. Weird odors. No, we don’t mean last night’s dinner. If you detect an odd smell coming from an outlet, turn off and unplug anything connected to it. Avoid using it again until you bring in a qualified electrician to figure out the issue. In older homes, which are common in the Washington, D.C. metro area, electrical outlets can be scarce. They are often spaced too far apart for modern living—sometimes only one per room!—which creates too much demand on too few outlets. Older, two-prong receptacle outlets that can’t accept three-prong plugs may not be adequately grounded and should be upgraded. This is a job for an electrician and an electrician’s tools. If you’ve ever moved into a previously-owned home or apartment, there always seems to be at least one light switch that doesn’t seem to turn anything on. This could be because the builder had it prepared for potential future projects that never came to pass. It could be because many older residences were not constructed with overhead lighting, so electrical codes dictated that a light switch be placed near entry doors to power a floor lamp. It could be that a previous owner detached some wiring. Rather than performing testing, crawling into your attic to check for wiring or cutting holes in your walls or ceilings, call a licensed electrician to figure it out. Licensed electricians have to go through extensive training and keep up to date with the latest electrical codes. They know how to evaluate the amperage of the circuit and the wattage of the new fixture. They can determine whether you will need an additional wire run from your circuit breaker. Many older homes don’t have the high-temperature insulation that is required for many ceiling lights and fans, which they will recognize and repair. If your outdoor lighting isn’t working, or you want to install some exterior lighting on your house? This is one time when professional electricians are definitely needed. They will ensure that the wiring is properly grounded for the outdoors and help you choose lighting that’s rated for the outdoors. Bottom line, super moms: the next time you ask yourself, “Do I need a professional?” you’ll know the common signs you need an electrician. And the answer is probably yes.